The UTAH-100/UDS-32AA provides a cost-eﬀective way to add analog audio routing capabilities to a larger routing system while maintaining full compatibility with the Utah Scientific family of digital video and digital audio routers, system controllers, and control panels. The UDS-32AA’s ability to handle analog audio signals in either mono or stereo modes oﬀers users a uniquely ﬂexible means to integrate analog audio routing into a wide variety of applications , including master control, where smaller matrix sizes are often required. The UDS-32AA oﬀers dual 32×32 matrices based on an 8×8 modular architecture. Each block of eight inputs or eight outputs is fed through a 25-pin D-Connector for connection to external devices. Breakout cables, breakout panels, and a simple rear-mounting breakout adapter are all available to simplify installation of the router. Two of the 32×32 matrix blocks are installed in one 2RU frame and can be controlled independently, providing simplicity of operation and ﬂexibility in multi-channel applications. The UDS-32AA router is connected to the Utah Scientific router control system by means of the control system’s MX-Bus. 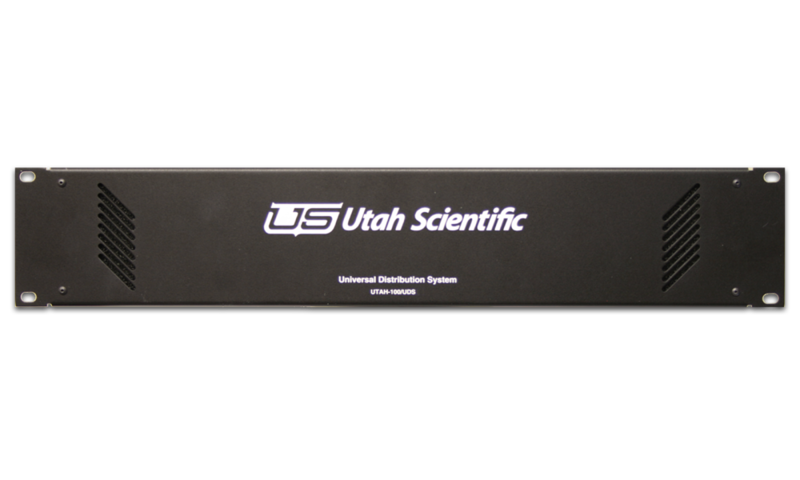 The UDS-32AA is compatible with all of the Utah Scientific system controllers from the basic SC-40 to the full-featured SC-4 which is the heart of some of the world’s largest mission-critical signal routing systems.